Last edited by Abdullah719; 12th January 2019 at 14:55. Nothing special. Looks an average bowler. We need bowlers with x-factor. These days it looks like we're going the parosi way... getting excited about random little talents. Fantastic bowling action and good pace for a 14 year old , love how he stays tall and remains close to the stumps while delivering. Very nice. Reminds me a bit of shabbir ahmed. who can one determine that a 14 old is average bowler by watching his single spell that too on video clip?please let us all know about your logic. Good action and seems to be bowling with good pace as well. Also looks tall for a 14 year old. Anyone know how tall is he exactly? Looks close to 5'8". Another great 130kmh bowler lined up for the future! Yeah looks decent but Im not sure he at his best would drastically improve us. Baba kid is 14 years old! Hafeez would be traumatised by simply seeing the kid's bowling action. This kid has a bright future ahead of him. 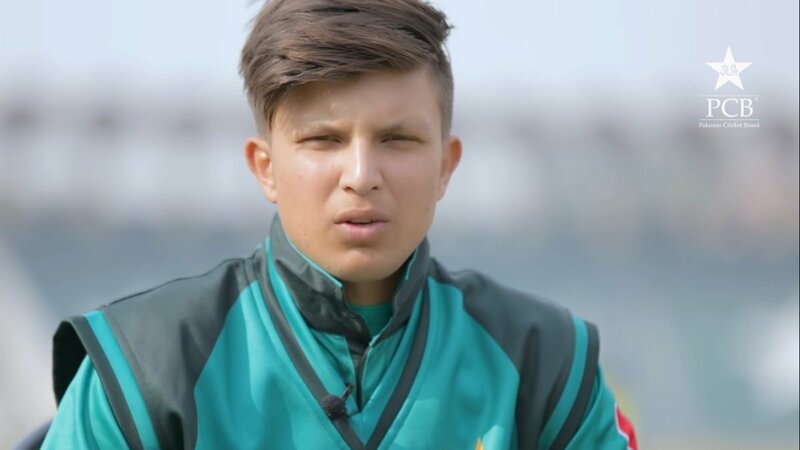 I first saw him a few months back in U16 cup final where he and Ayaz were representing KPK (that match is available on PCB's youtube channel) and straightaway I was impressed. 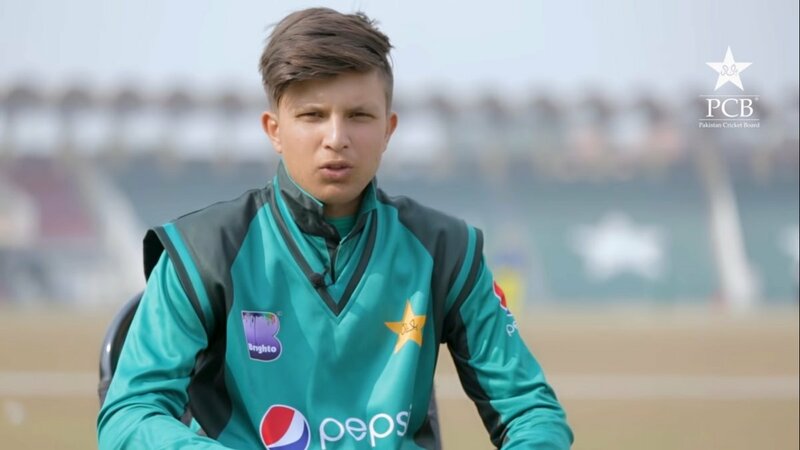 Arm chair experts should realize that he is only 14(studying in 9th class ) and at that age most bowlers struggle to keep their line(Ayaz has this issue despite being older than Ahmed) yet he is bowling with control and the kind of outswing he is getting in UAE and at Faisalabad is amazing. He has the potential, should keep working hard. PCB needs to hire Allan Donald to coach these under 19 pacers. Listening to his master class reminded me that locking the wrist is not the only thing a fast bowler need to become a wicket taking option. Can see him bowling 140+ easily once he gets to 18 years of age. In next two years his physical development woukd be crucial. What did you expect-If he is 14 then that is quite incredible. At a similar age Adam Finch who plays for Worcestershire and England U19 was barely hitting 65MPH, today he can hit 85mph on a regular basis. Man, some of these posters want 14-year-olds to be bowling like Starc! How many of you have seen a 14 year old bowling 150 ks? Very good action and bowling at a decent pace for a 14yr old. Pak keeps producing bowling talent and its no secret. 120 kph is quite amazing for a 14 year old. People commenting on here as if the kid is 24 and not 14. I don't take hype seriously anymore. Have seen many times players being hyped and getting exposed badly at the international level. Might be worth pausing, taking a breath and thinking back at how good you were at cricket at the age of 14. Posted the video on here. People can decide for themselves what they make of the lad. Which bowler hits 150 KPH+ at age 14? If you have looked at the highlights one can point out that Aus u16 opening pacer bowled alot quicker than this guy, so definitely hes not a gun of a talent to be hyped yet. I watched the U16 game highlights last night and this kid stood out. Bowled a good line, ran in fast and action resembles somewhat like Mohd Asif. Hope he gets taller and builds more strength. Australia's opening pacers are both 16. This kid is only 14. PCB contact says around 5 foot 10"
That’s great height for his age. Kid looks genuine 14, so should grow another 3 to 5 inch. Can somebody tell this kid bowling alone may not give you success. Work equally hard on batting and aim to be a good number 7/8. seriously take a step back and realise your commenting on a kid here, not an adult, and someone who more than likely will see this. fwiw i think he looks great, has decent control and a nice action. with age he'll get taller and stronger and as long as he focuses on his fitness, core and legs his pace without doubt will improve. I doubt he would be reading up on anything. He’s probably dropped out of school ages ago or will do so soon. I’ll tell you the last time I saw talent so young. Mohammad Amir aged 15 touring England with Pak U17s. A 15 year old boy hitting 87mph! That’s something extraordinary! Probably summer of 2007, Ahmed & Amin also was there and both hit hundreds in longer format (Ahmed probably 160+ in a chase over 300). One of my UK based friend mentioned all 3 to me later. However, Amir definitely wasn’t 15, more like 17-18, still outstanding in that LO series. If someone can guage a bowler's true potential, while he is only 14-16, then I would like to ask them for next lottery numbers as well! I honestly think he is good/much better than most bowlers at 14-16 years of age because thinking of my school days, most bowler at that age, if they could even land the ball in the same spot, irrespective of pace/swing; most will consider them to be pretty decent. This kid has a weapon that most of our senior bowlers don't have i.e. a very good outswing. With proper training, diet, and fitness regime, I see no reason why he can't be a great prospect especially if he can get a bit taller, say 6' 2'' or more. Again, he is just a 14-16 year old kid, anyone saying he is mediocre for his age, is serious nuts! He is a 14 YO kid, one of a kind at his age, I see great future in him. Who knows he might be the best looking fast bowler to play for Pakistan after Imran khan, in future. You guys are forgetting your younger days. 5 10 is amazing height for a 14 year old (I was like exactly 5'2 then), this kid has at least another 4 years of growth, kid will grow to be 6'3 at the least. That means he might end up close to 6'2" or even taller. A tall fast bowler with good pace and swing as well will be quite an asset for Pakistan. The kid has a bright future ahead of him. Lol some people are ridiculous here. The kid is young for his age he is very good, but next 3-5 years will be crucial. Top scored with 55, and now two wickets in his first spell. A wicket for the left-arm leggie now. Last edited by Abdullah719; 12th January 2019 at 14:56. I like his bowling but not his batting. Bad technique and no real foot work. As a 14 year old with some ability coaches should be looking to equip him with a good proper technique with nice footwork. This kid seems to be getting better with each game: those 3 sixes, all on the off side, that is unreal stuff for a bowling all rounder (if he can be called that this early). I don't recall the last batsman in Pak team who could dominantly hit all his big shots mostly on the off side, obviously while playing on merit. Most of our hitters go the long mid-on and mid-wicket route and end up getting caught at least half of the times! Indeed. Some of the posters need to take a look in the mirror and stop criticising just for the sake of criticising. That's some unreal stuff even for a proper genuine hitter, he whack those off side sixes with such an ease, if he can improve his technique and show some temperament, there is some serious talent in our hands, next Angelo Mathews perhaps? With of course better bowling. I don't think our national side batsmen can whack on offside like him and mind you aussies u16 pacers are no trundlers they seems to be operating at 130-135k range. Amir was an extraordinary talent. You can't compare everybody to him. This kid has very good mechanics and good pace for his age. Its how you play dots, concede singles and respond against boundaries that actually matters when judging a bowler. similarly, its how a batsman score singles, respond to a good bowling spell, survive and then attack a bowler, all the while keeping his team in the hunt, is what actually matter when judging a batsman. These two minute videos can't possibly help the fans judge the talent. Who has seen the future on whether or not he develops into an international bowler but kid's action is smooth like butter. Not that I follow too much or under -15/19 cricket, but haven't seen such a smooth bowling action for that young a kid. Rather than debating how good or bad he is, let's just all wish kid a great future, any hard working kid deserves that. Damn finally someone gets it. Judge a batsman not by how long of a six he can hit but by how easily he can maneuver the ball into the gap. So he’s 2 years older than his official age according to you? Loving this kid. Lets fast track him i say. We gave a debut to an 18 year old Shaheen just recently. 14 is way too early though. Let's wait for him to turn 18 first. Way too early to bother making judgements, hopefully keeps his head down and works hard. I like the simple action. You fast track extraordinary talent. Like Amir at his age. This kid seems fine, not extraordinary yet and if he can add 5-10kph pace in 3 years then that would be something. Should keep working hard, isn't too bad. There's a few of them who look good. Let's see how he is doing in a couple of years.